As anyone at Butler could tell you, the significant presence of the arts on campus is one that everyone, no matter their major, will find themselves participating in during their time here. This is due largely in part to the Cultural Arts Requirement, known commonly as the “Eight Before You Graduate” initiative, that helps form the backbone of a Butler education. Students at Butler must attend a minimum of eight approved events “to engage students in these most valuable and exciting learning opportunities, and to encourage students to develop habits of participation in artistic and cultural events that will lead to lifelong engagement with the creative arts and public intellectual life,” according to Butler’s official statement on the topic. 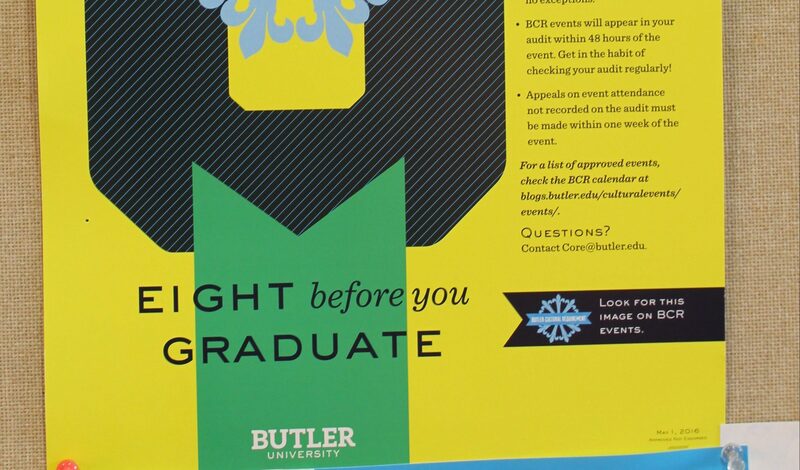 Butler is not unique in its attitude toward the arts, but many college campuses across the country are sadly lacking in their artistic outlets and educational policies. This leads to class after class of students who come and go knowing nothing about a massive cultural institution in this country. Despite the fact that, according to the International Federation of the Phonographic Industry, the United States’ music industry alone generated approximately 16 billion dollars in 2016, most students remain entirely uneducated about the arts community. Students are not aware of its opportunities and massive significance it has in both the United States economy and the social and even medical world. The largest problem with a lack of understanding about the arts is the detriment it becomes to the arts themselves. Insufficient education and interest leads to a shortage of funds and resources, which thins the herd of ensembles, teachers and programs until they are too few and far between for a critical number of young people to participate in. The arts themselves are vital in a host of different ways, ranging from early childhood development of critical thinking, collaboration and self expression. The arts are also therapeutic for those with mental illnesses, the intellectually disabled and those suffering from shock or traumatic events. Without an understanding of the arts, thousands of people who benefit mentally and physically from the presence of an art form in their life would be left without a support network. I spoke with a variety of Butler University students and faculty to better understand the campus mentality toward the Cultural Arts Requirement and how they believe Butler is shaping collegiate minds through their incorporation of the arts into their core curriculum. Christa Schwinke, first-year business major, said she recognizes that coming from a smaller hometown can often limit a student’s initial experience with a variety of art forms, the largest obstacle for those unsure of how to begin a foray into the arts. “If you’re not exposed to [the arts], you don’t really know anything about them … it all really depends on what you had the opportunity to participate in when you were growing up,” Schwinke said. However, Schwinke believes exposure to the arts through the Cultural Arts Requirement will help her to step outside her comfort zone and grow. “The more I’m exposed to the arts, the more I will understand about the field and the more I’ll be able to form my own opinions — and appreciate art, too,” Schwinke said. Junior pharmacy major Lexi Graves offers a more seasoned opinion, having completed her requirement with enough extra time to enjoy her flexibility in picking shows and events she’s interested in. Graves said programming with the target audience in mind is a key way to foster interest in the student body. Graves believes that genuine appreciation for the arts will be easier to nurture by appealing to students through interesting performance groups and artists with an entertaining presence. Doug Spaniol, professor of bassoon and interim chair of the School of Music, and Matt Pivec, director of jazz studies, have a similar mentality when it comes to the significance of an arts education in the lives of young adults. They said an arts education is an important catalyst for open-mindedness and an ability to understand cultural essentials. Butler’s active push for a universal arts education through the arts requirement means that generations of Dawgs will graduate as open-minded, curious and inclusive community members. Butler students represent a bright future for both the arts community and the community at large, and serve as role models for other college students and young adults who may not know how to approach the arts community.